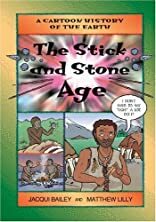 The Stick and Stone Age focuses on the proliferation of mammals, the cooling of Earth's surface and the emergence of early man. The Stick and Stone Age is part of A Cartoon History of the Earth. Each book closes with a timeline, a comprehensive glossary and an index. Scientific consultants, chosen for their particular areas of expertise, have verified all the factual information. Combined with humorous dialogue and comic-strip illustrations, each book in the series is at once entertaining, engaging and -- educational!